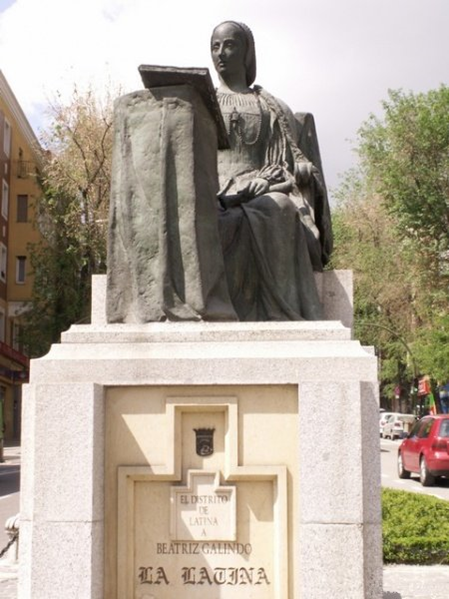 Statue to Beatriz Galindo in Madrid © J.L. de Diego-Madripedia. ​Beatriz Gallindo, La Latina, 1474-1534, Beatriz was born into a family of Zamoran origin of the lower nobility of hidalgos, spouse to Franciso Ramírez de Madrid who served in the Granada War as gunner and later as Secretary to the Council of king Ferdinand and accountant of the house of prince Juan. Beatriz was considered one of the most cultured women between the fifteenth and sixteenth century, a time of transition. Beatriz took her degree in Latin and Philosophy from the University of Salerno in Italy while also studying theology and medicine. She was a grammarian and Humanist of Aristotelian learning. She returned to Spain where she became a professor of Latin at the University of Salamanca and Professor of Latin letters of the Castilian court of the Catholic Monarchs including queen Isabella of Castile and her daughters Mary of Aragon and Castile, future queen of Portugal, Catherine of Aragon, future wife of Henry VIII of England, and Joanna of Castile, future wife of Philip of Habsburg, later known as Joan the Mad. ​She wrote poetry in Latin and produced poetry, gave commentary on Aristotle and other classical figures and was nicknamed La Latina because of her skill in Latin. She was one of the first women to be active in public life in the early renaissance reportedly dressing in the habit of a nun. Her husband Francisco wished to establish a hospital in Madrid and began construction in 1500 suffering an untimely death a year later. In 1505, Beatriz took on the responsibility of finishing the hospital, opening the Hospital of the Holy Cross or as it became known de la Concepción de Nuestra Señora but after four centuries of use and continual restoration extending the surrounding public space the hospital building was demolished. No written works of Beatriz Galindo have been preserved, although Latin poems and comments are attributed to the work of Greek and Latin authors, especially Aristotle. © valyag. CC BY-SA 3.0. Howard, Sethanne . The Hidden Giants. Washington Academy of Science, 2012.